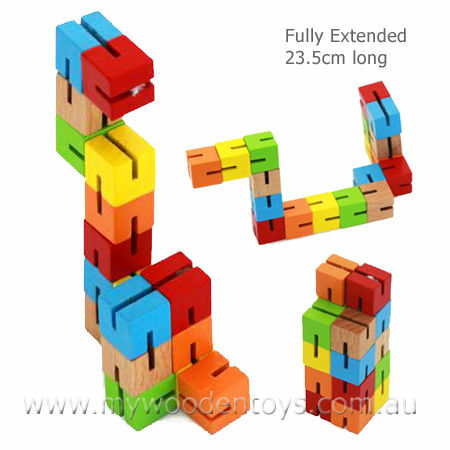 Mini Wooden Fidget Puzzle Multi-Colour is a little fun fiddly wooden toy made up of 18 x 1.3cm cubes all held together with a piece of elastic through their centres. All the cubes have slots in them so the blocks can only be placed next to one another if the elastic can find a slot to sit in. So you have to fiddle and twist to manipulate it into the shape you desire. This is a cute little toy but very addictive and entertaining for its size. Wonderful quiet toy for kids who need to fiddle. We like this because: "All sorts of fun shapes can be made."